of a layer to interact with the underlying image. Although I don't like or use the mask feature in PSP very often, I found a use for masking that I can show pretty quickly and clearly. Four of us are working on a image. 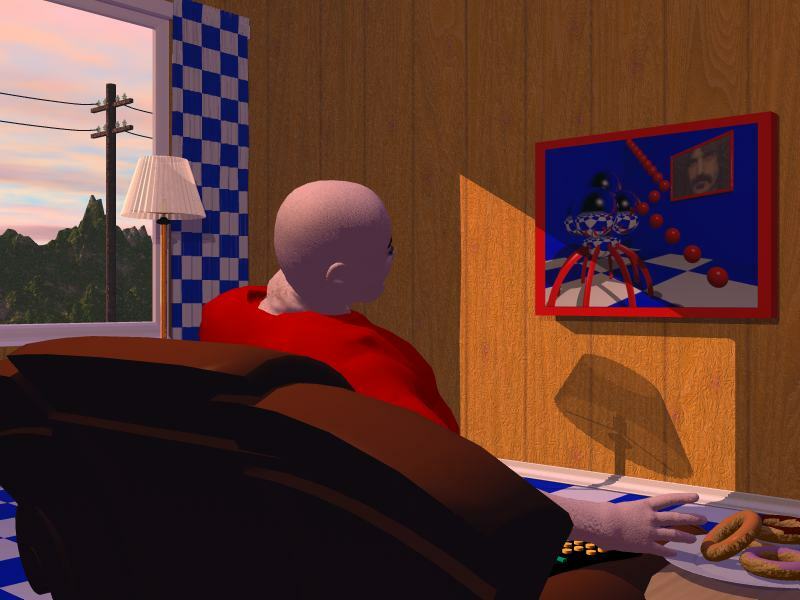 The base image, shown below, was created by our own HOST Comp Rosy in Poser 4. She send BigBaldo.jpg to me. I used it as a background in Poser 4 over which I positioned and posed a lovely female haggish character and matched the basic lighting directions and intensities with the base image. I rendered the Old Fat Gal over a neutral grey background in Poser.. I opened both the BigBaldo.jpg and OldFatGal.jpg in PSP. My goal was to composite the OFG into the BigBaldo image making it look like she was always there. Click on the links above or the images above and save the larger images to work in in PSP. Rendered in the right position relative to where I want her in the final composite, I copied the OldFatGal image in its entirety by right clicking on her title bar and picking Copy from the flyout box. Then I right clicked on Big Baldo's title bar and picked Paste As a New Layer from the flyout box. Click in the grey background area to select it. Invert the Selection to select just the figure. Go to Selections > Invert on the Menu Bar. 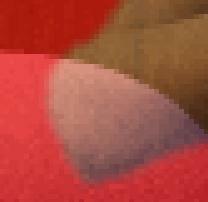 We need to get rid of a bit of grey between her thighs and around her hair that should be transparent. Use the Zoom Tool and drag it around her knee area. About a 6:1 zoom ought to give you a good view of the left over grey area. Select the Magic Wand again, and set the tolerance on the Options palette to 18. Hold the CTRL key on the keyboard and click in the grey area to remove these pixels from the selection. By increasing the tolerance, a larger range of grey pixels is selected. Still zoomed in close, press the W key on the keyboard to bring up the Overview navigator. On this window, click drag bounding box up over the woman's head. Notice that as you move the overview area, the window scrolls to follow. With the head in view, pick the magic wand tool again on the Tool Palette. Hold the CTRL key and click just under the ear on the right side of the image to get rid of the neutral grey pixels still in the hair. After, it should look like this. Let's soften the selection a bit and feather it's edges to blend in better in the base layer. Go to Selections > Modify > Contract... on the Menu Bar. Go to Selections > Modify > Feather... on the Menu Bar. Set this value to 2. Although the selection appears the same, the edges are partly transparent. On to the Mask making part. On the Menu bar, pick Masks, > New > Show Selection from the flyout boxes. Notice how the grey part drops out instantly. Only the old fat gal shows against the background image. WOW.. What is going on? Fire up your layer palette if it's not visible with the L key on the keyboard. Notice that Layer 1 has a face beside the eyeglasses icon. That indicates a Mask is active on the layer. On the right side of the layer palette, click the Mask tab. See the Mask icon there next to the Chainlink? Click on the that mask icon to disable the mask. Try it and see what goes on in the image. When the icon has a red X through it, the mask is gone and all those grey pixels show again. Turn it back on. Since the woman is perfectly positioned, all we need to do is remove the elbow area and part of the legs and feet (Unfortunately, her best assets) and she will look like she is meant to be in this picture. We will edit the Mask to do this. First, on the Layer palette on Layer one, click the eyeglass tab on the right panel to get back the merge mode and transparency sliders. Slide the transparency to about 30 percent so you can see the intersection of the elbow and the fat bald guys head as well as the intersection of the OFGal's legs with the red sweater and the chair. Use the zoom tool to zoom in on the elbow head connection. Pick the Lasso Tool from the Tool Palette, and set the Tool Options to the following. Make a selection around Baldo's head where it meets the elbow. From Selections on the Menu bar, do a Modify contract by 2 pixels then a Feather by 2 pixels. Go to Mask on the Menu bar and choose View Mask. 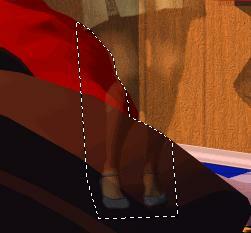 on that gal layer is red. Go Back to the word Mask on the Menu Bar and pick Edit Mask. Caveat: With Edit Mask toggled on you edit only the mask. With it toggled off, you edit the actual layer! Note that the color palette changes to all greys. greyscale image superimposed over the main image where each shade of grey represents a degree of transparency. Set the foreground color to pure white. 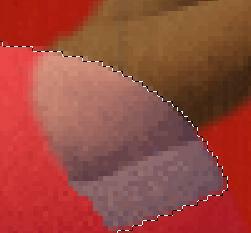 When you paint on a mask with pure white, RGB 255, 255, 255, the underlying area, the hidden pixels are exposed 100 percent. Try painting in the selected area with the brush. Notice how the grey pixels show up again? We want to make the elbow invisible! Press UNDO, CTRL + Z on the keyboard until the area just painted goes back to red. Switch the Foreground color to pure black and Paint over the selected area. Notice the elbow goes red, meaning its masked, or hidden. Therefore painting with pure Black, RGB 0,0,0 hides the pixels 100 percent. On the Menu Bar do a Masks, and click the Edit again toggling off editing on the mask. Toggle the View Mask off by Mask >View Mask from the Menu Bar or by pressing CTRL + ALT + V on the keyboard. Remove the selection. Zoom out to 1:1. On the layer palette move Layer one's transparency slider to back to 100 percent. Repeat the procedure for the legs. 1. Slide the layer one opacity to 30. 2. Zoom in on the legs where they hit the shirt. chair and around the legs in the shirt and the chair. 7. Turn on Edit mask. 8. Pick the brush tool set to black for the foreground color. The old fat gal is "behind"
the chair and in front of the wall. Caveat: Save now in the .psp format to save the Mask information with the image! OK, you ask, how could one do it any other way? 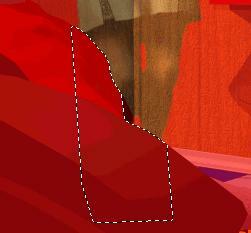 I could have selected the OFG in her own image, then copied that selection and pasted to the BigBaldo image as a new layer. Then I could have positioned her and erased the areas I wanted to hide, either by selecting those areas and hitting the delete key or by using the eraser tool to erase them. Let suppose the next person to work on this image, like maybe Jinny, wanted to move my girl to the right. If I had just erased the areas here is what would have happened. Looks the same to start, eh? But move this layer to the right some? If you plan on changing the position of a layer several times, especially after hiding parts, and after saving and closing the image, use masking, as it preserves the underlying layer. Masking is non destructive to the actual layer! If you know you are not going to move the layer ever ever again, I think its quicker and easier to select the areas you want gone and do an edit clear. 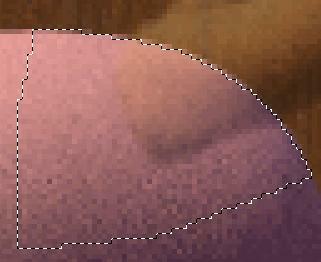 After you save and close the image, that layer information is gone, permanently changed. Your choice. See finished image below. You can go on with this to add a perspective shadow if needed to make the image more realistic using a third party plug in like EyeCandy 4, Shadow lab.